Incredibly cozy and welcoming, recliner chairs are the best, if you are looking for truly relaхing experience. To be completely honest, recliner chairs are second to none, when it comes to the level of comfort they can offer – there’s nothing like leaning back in your recliner after a hectic day at work. Surely, recliner chairs are more expensive than ordinary armchairs, but they truly are worth the investment. Modern furniture stores will offer you a wide range of recliners , from sleek contemporary models to classic and dignified leather ones. And if you want to purchase a unit fully tailored to your individual needs, these tips and advice for choosing a recliner chair may prove helpful. You may dream of a big oversized recliner, but, obviously, a unit like this would look too obtrusive, if it is too big for your living room. Make sure you know the right dimensions and take measurements, if necessary. A classic recliner has a headrest, a footrest, large and soft armrests and a moveable back, which reclines as you lean on it. But is there any feature you absolutely can’t do without? Whether you are looking for an orthopedic recliner with lumbar support, a massage chair, or an ultra modern power recliner controlled with a single press of button, modern furniture stores will have something to offer you. 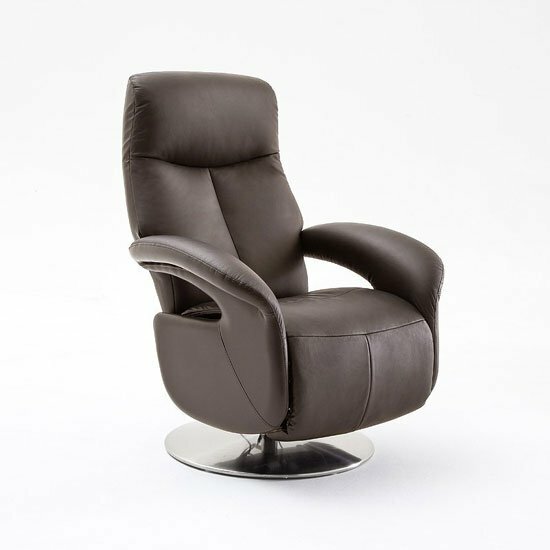 Solid base is an essential element of a quality recliner chair. Ideally, a recliner should have a circular metallic base and the seat should rotate effortlessly around its axis. A steady base ensures your recliner is perfectly balanced. Most tips and advice for choosing a recliner chair you will find online will tell you to focus on quality of screw-bolts and levers as well as the chairs’ frame. Ideally, the recliner frame should be made of quality hardwood – plywood will also do, although this option is cheaper and will have shorter lifespan. A recliner chair, which is both bulky and expensive, should offer top-notch comfort. To ensure that, the density rate of the foam filling of the recliner’s cushions should be 1.9 or higher. Most tips and advice for choosing a recliner chair will focus on technical characteristics, but looks are extremely important. A recliner chair will serve you for at least 10 years in general, so it should be pleasant to look at and be in sync with the interior theme of your living room . It is actually possible to find modern recliners as well as classic ones in furniture stores. If you opt for fabric upholstery, wool is obviously the best choice – it is natural and easy to clean. Chic and classy leather options will surely bring in a sense of wealth and respectability, but will require special maintenance – to learn how to take proper care of leather furniture, read this guide . Finally, to test drive your recliner, sit in it for 3-5 minutes and see how it feels. If you shop online, visit a store showroom to test your unit – this means you will have to stick to reputable stores such as Furniture in Fashion.